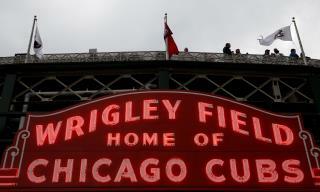 (Newser) – A man who struck his head after tumbling over a railing at Chicago's Wrigley Field has died, reports the AP. The Cook County medical examiner's office says 42-year-old Richard E. Garrity of Wheaton was pronounced dead Wednesday at Advocate Illinois Masonic Medical Center. Authorities say Garrity fell over a railing after Tuesday night's game between the Chicago Cubs and Cincinnati Reds. Police say he suffered head trauma from the fall. The medical examiner has scheduled an autopsy for Thursday to determine the cause of death. Having been a season ticket holder, I am trying to visualize where and how this could have happened. You have really go out of your way to be put in that situation. Since it was well after the game ended, the logical leaning over from the upper deck doesn't seem to apply either. I can even picture the drunkest of the drunk doing this. Falling never killed anyone. It's the sudden stop at the end that does the damage.